A splash screen is a popup window with a logo or image that normally appears at the center of the screen when you run a program. Not all software has splash screens as they only show up if the developer of the software decides to add it in. Most of the time splash screens are implemented just to add some eye candy to the software to attract the user but very few really require it. Heavy software such as Adobe Photoshop or AutoCAD that takes quite a while to load might find having a splash screen useful to show the current status of the startup for troubleshooting purposes. As for other splash screens, they are there without a purpose and users are normally annoyed by them because the splash screen stays always on-top causing the user unable to see or access anything behind the splash popup window. Some users also feel that the program loads slower if a splash screen is shown. If you are one those that find splash screens unnecessary or useless, here we’ll guide you on how to disable the splash screen for some of the most popular applications. Other than that, we also introduce an interesting tool that can automatically detect and hide splash popups for certain programs. Here is a selection of nine popular applications where you can disable the splash screen if you have no use for it want it to be permanently removed from view. Note that doing this might or might not necessarily make the program load any faster. The ESET splash screen is only shown once when the program is started when Windows is booted up. If you have a slow computer that takes quite a while to boot up Windows or perhaps you have a lot of programs in startup, you might want to disable the unnecessary ESET splash screen although it doesn’t really interfere when you start using the computer. 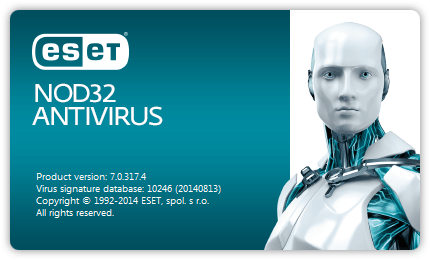 To disable it, run the ESET program, click on Setup and click Enter advanced setup. Expand User interface, go to Graphics and uncheck “Show splash-screen at startup“. JDownloader is written in Java and there is a bit of delay for the graphical user interface to show when you run it. 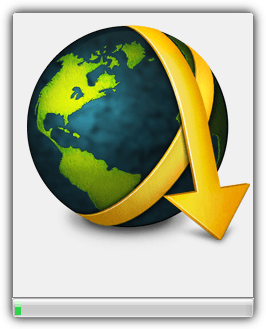 There is really nothing useful in JDownloader’s splash screen other than an animated progress bar. 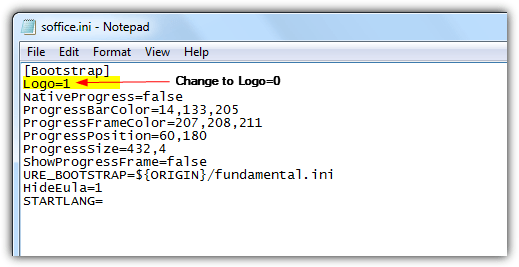 Disabling the splash screen in JDownloader is quite easy. 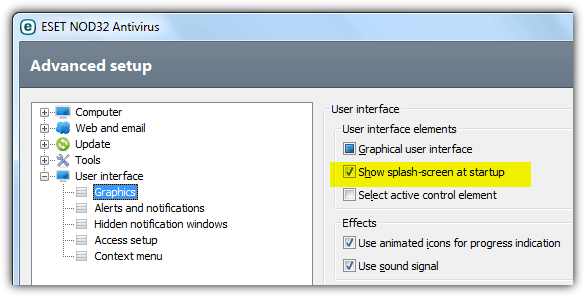 Go to the Settings tab, expand User Interface and uncheck “Show splash screen on startup“. 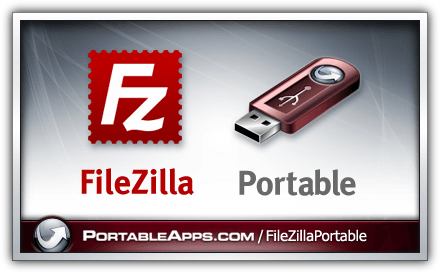 You can find over 300 unofficial portable builds of software such as Notepad++, GIMP, IrfanView, FileZilla, Google Chrome, Mozilla Firefox, VLC Media Player, 7-Zip and etc in PortableApps.com which are guaranteed to be safe from malware. All of the software made portable by PortableApps shows a splash screen which can be easily disabled by copying the program’s INI file from Other > Source folder to the root of the program’s folder, edit it with a text editor and change the DisableSplashScreen=false to DisableSplashScreen=true. 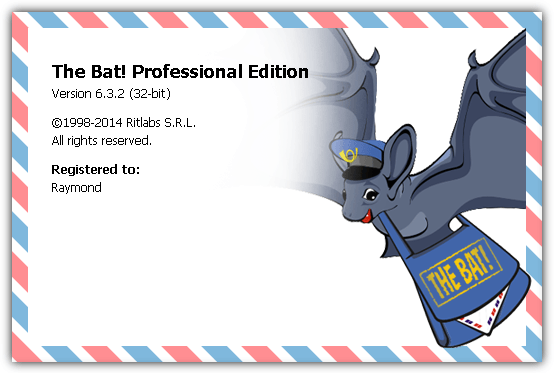 The Bat! is one of the most secure if not the most secure email client that is safe from vulnerabilities such as pFragments Microsoft Office exploit and Heartbleed bug in TLS. Launching the program each time will show a not really useful splash screen which fortunately can be easily disabled by adding a /nologo at the end of the shortcut’s target. Simply right click at The Bat!’s shortcut, select properties, make sure that you’re at the Shortcut tab, and finally append a space with /nologo at the end after the double quotes. OpenOffice is a free alternative of the paid Microsoft Office suite with applications such as Writer to replace Word, Calc to replace Excel, and Impress to replace PowerPoint. The splash screen shows absolutely nothing useful other than a progress bar so it is best to just disable it. 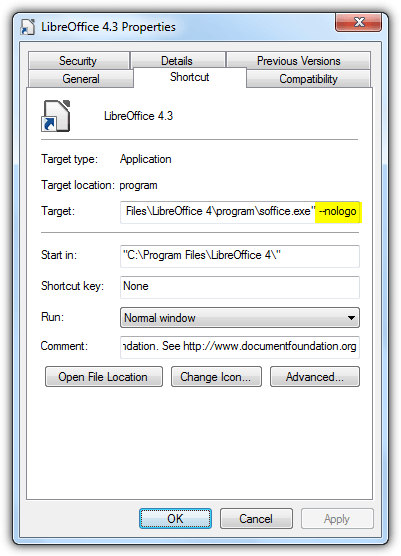 To do that, open the file soffice.ini located in the program’s folder with a text editor and change the Logo=1 to Logo=0. Save the changes and you won’t see the splash screen again the next time you run any of the OpenOffice applications. LibreOffice is based on OpenOffice code base but the splash screen you get from LibreOffice can be quite useful as it shows the information of the current progress such as “synchronizing repository for bundled extensions” which is shown at the screenshot above. 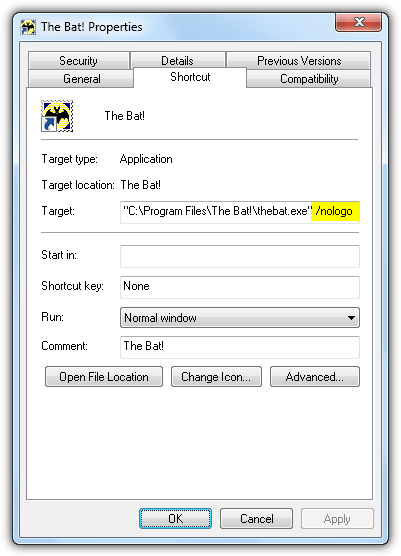 You’d probably expect to use the same method as OpenOffice to disable the splash screen but it actually uses the shortcut method such as The Bat’s which is by adding --nologo to the end of the shortcut’s target. 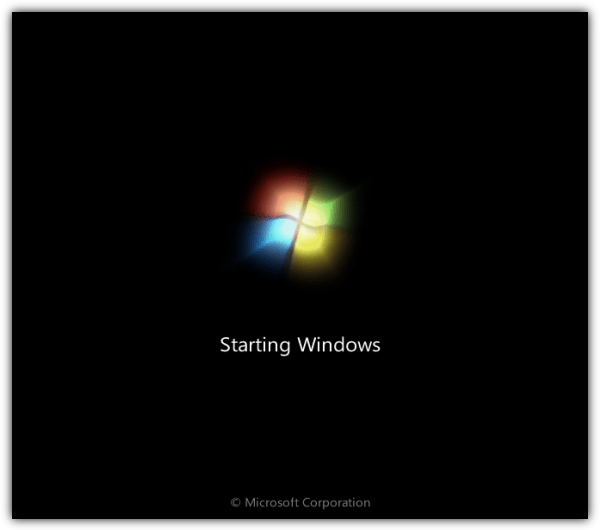 If you haven’t noticed, the Microsoft Windows operating system shows a full splash screen whenever you start up the computer. Back in the Windows 98 era, the user could simply press the escape button to hide the splash screen and see the autoexec.bat commands being parsed. 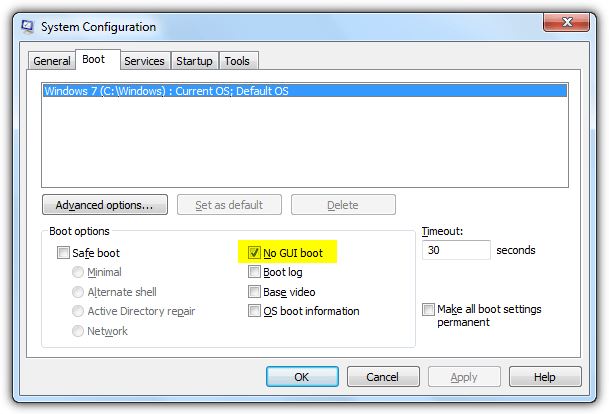 In Windows 7, it is called the GUI boot and can be easily disabled from the System Configuration (msconfig) tool. Press Win+R to launch the Run window, type msconfig and click OK. Go to the Boot tab and tick the “No GUI boot” checkbox. 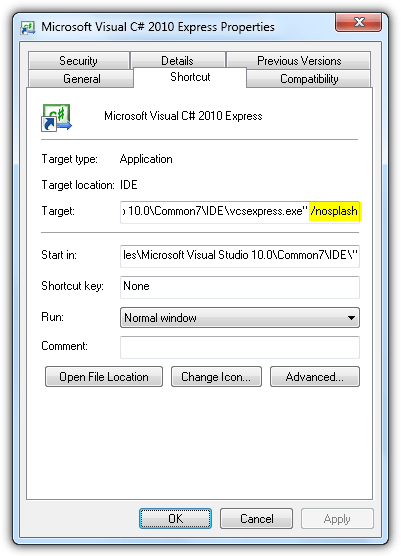 For programmers who uses Visual C# and are annoyed by the splash screen that offers no benefit, it is possible to disable it by adding a /nosplash to the program’s shortcut. 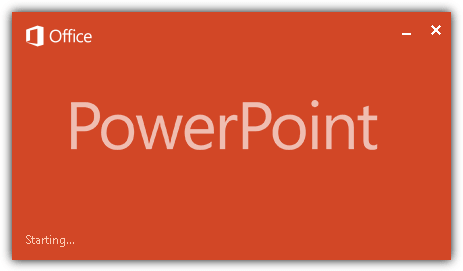 All of the applications from the Microsoft Office suite show a splash screen but weirdly we are only allowed to disable them from Word, Excel and PowerPoint but not Access and Outlook. In fact each of the applications use a different parameter to disable the splash screen. Simply edit the individual shortcut’s and append the parameter based on the list below. SplashKiller is a unique portable, lightweight and free application that sits in the system tray notification area attempting to detect and hide any splash screen it finds. 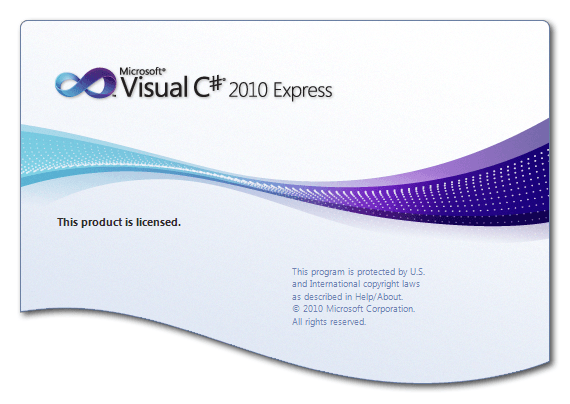 This tool was last released 10 years ago in 2004 but is surprisingly still able to successfully kill splash screen from some current software such as ESET version 7, LibreOffice, OpenOffice, Visual Studio Express and etc. 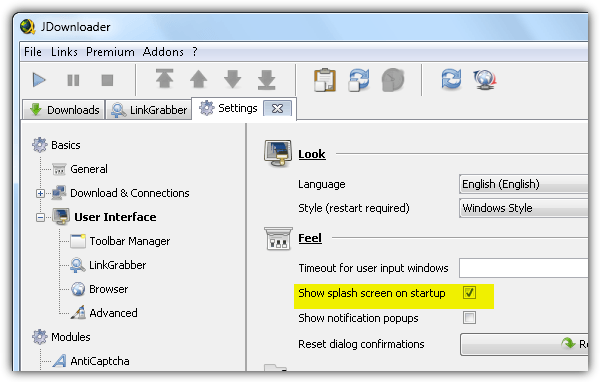 When the SplashKiller tray icon turns red, it means it detected a splash window and attempts to hide it by moving it away from the screen which you might see it on another screen if you have a multi monitor setup. SplashKiller takes up less than 1KB of memory. If SplashKiller mistakenly hides a non splash window, you can add it to the ignored application list from the config area. please also write an article to disable splash screen in “sandboxie”. The Sandboxie window is not a splash screen but a nag screen because you are using the free version. Splash screens are there not for advertisement but in order to make the user know that the application has started. Some applications take a long time to load and without a splash screen, the user can wonder whether it has started or not. Splash screens don’t make programs start slowly: it is because they start slowly that they have a splash screen. See above. You say that sometimes they are not necessary, but you don’t think of people who have out-of-age computers, with low memory, for which even a small app takes a lot of time to launch. Splash screens are there for better user experience. As a user, you can decide that it is a bad thing for you, but for a programmer looking at the best for his users, a splash screen is a must. no, It does slow down if you are the user with low resources. Disagree. If you are configuring a PC for other people, you don’t want them dealing with issues like this. One wants the PC to start up and be ready to go without confusing third party splash screens cluttering the start of the day… especially for office workers and such. If you like it personally, then that is good for you, but most personal users already know these things and moreover aren’t paranoid about “something not loading or running and having to tell you with an annoying splash screen.. If you need a splash screen to let you know your app is running, then I’ve got news for you… you are paranoid, because there a whole lot of other running programs in the background that you also should be watching and that will keep you busy for a few more hours while deleting splash screens that clutter your desktop… just so you can feel satisfied that they are running. Sheesh! That’s probably not possible as all software is coded differently. If there was a way you can bet there would be a tool around somewhere by now.